AZ Roofing Works takes pride in establishing and maintaining solid relationships with multiple real estate professionals serving the greater Phoenix metro area. From realtors to property managers, we understand the highly complex and time-consuming process of finding reliable, trustworthy, ethical, and professional roofing contractors who can complete a roof inspection, certification, repair, or rebuild project on time, within budget, and always with a focus on quality. AZ Roofing Works offers high-quality roof repair, replacement, inspection, and certification solutions for residential home owners. Since 2013, our team of experienced, licensed, insured, and bonded roofing professionals have completed residential roof projects and help real estate professionals serve their clients to expedite the sale of their properties. AZ Roofing Works provides services for single-family homes, multiple-family homes, for real estate agents in Mesa, Chandler, Scottsdale, Tempe, Gilbert, and Phoenix. From retail outlets, to strip malls and apartment complexes, AZ Roofing Works offers complete commercial roofing services throughout the Phoenix Valley. We work with property management groups, apartment complex ownership managers, and commercial real estate professionals to complete roofing services for their clients. AZ Roofing Works has completed multiple commercial roofing projects, from office buildings, churches, and storage facilities. With every project we undertake, our team places an emphasis on quality-driven results, by using the highest-quality materials, and advanced construction techniques. If you have a commercial property that requires a roof repair or roof replacement – AZ Roofing Works has the Experience You Can Trust. Arguably one of the biggest hurdles to a quick and profitable real estate sale is having an accurate and efficient roof inspection and roof certification completed. 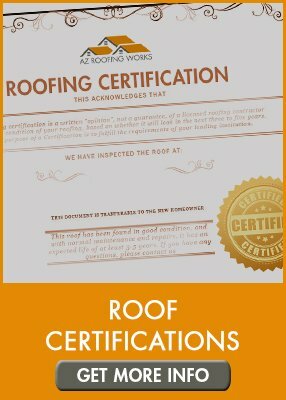 AZ Roofing Works provides inspections and certifications for tile, shingle, and flat roofs on residential and light-commercial properties. We help property managers by completing quick and detailed inspections for property evaluations, due diligence evaluations and lender inspections. We also help other real estate agents serve their clients by completing roof certifications for property sales or to make improvements prior to listing. Whether you serve clients near ASU, off the 101 or I-10 – our team of passionate and experienced professional roof service providers will cater to your needs. Our dedication to craftsmanship, getting the job done right – the first time, and our dedication to open and clear communication are trademarks of AZ Roofing Works. We offer Experience You Can Trust – and we offer FREE roof estimates all the way to full roof replacements and everything in between. Why AZ Roofing Works? Because our team has Experience You Can Trust! 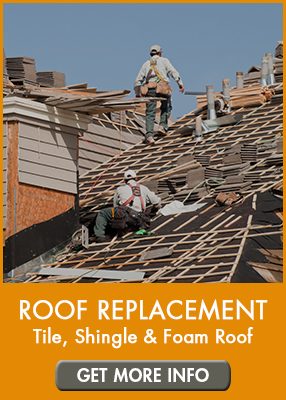 The AZ Roofing Works team is ready to help you! Contact us today, either online or call our office directly at (602) 283-3383. You can also submit A Free Estimate Request now! AZ Roofing Works is the preferred residential & light commercial roofing contractor in Mesa, Chandler, Scottsdale, Tempe, Gilbert, Phoenix & beyond. 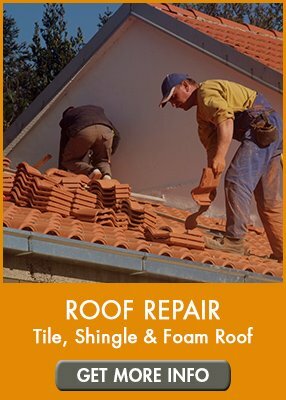 If you are looking to use the best tile, shingle, foam or flat roof repair and replacement company in Phoenix, then request your free estimate today. How Long Does a Tile Roof Last in Arizona?